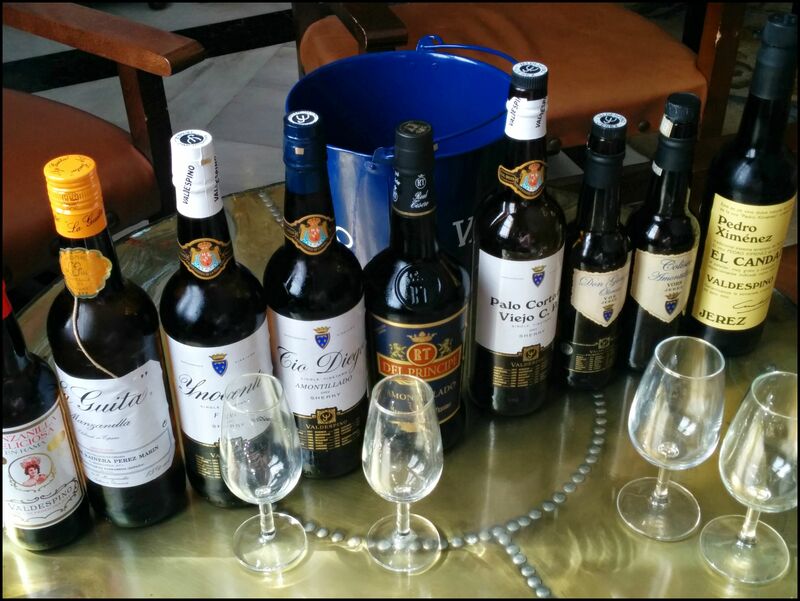 One of my first sherry tastings was with Jaime Gil from Grupo Estévez. I remembered anything he poured from Valdespino agreed with me. Naturally, he was the first person I contacted when I planned my Sherry Odyssey back in April. I was curious how my visit would be, knowing how full his schedule was. It was a miracle with his travels that he was even in town! He arranged for me to join a tour of the bodega, then met up afterwards for our private tasting. The facility is beautiful and truly the largest I had seen – encompassing the wineries for Real Tesoro and Valdespino. 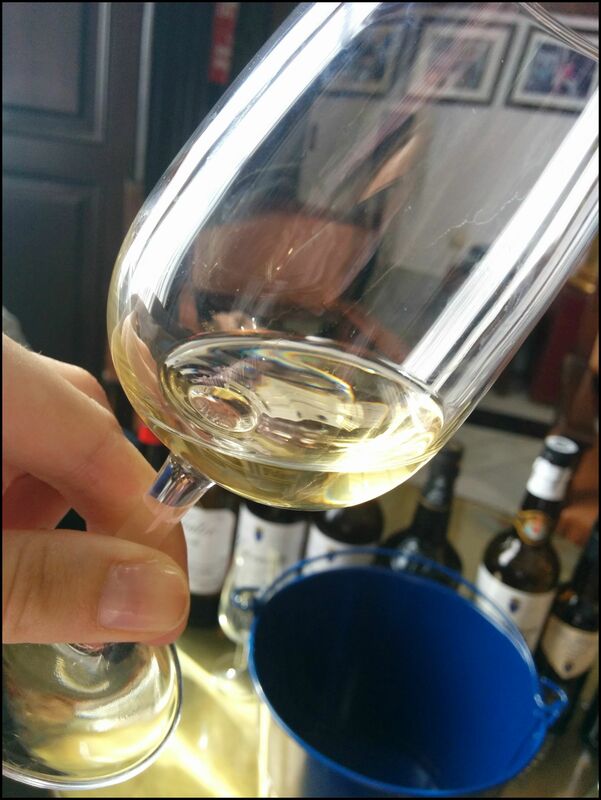 La Guita is also under Grupo Estévez, but housed in Sanlúcar de Barrameda where all Manzanilla is produced. Grupo Estévez is also one of the few wine makers who have their own vineyards in Jerez. The Bodega Lola wine cellar, named for the iconic flamenco dancer Lola Flores, houses 12,000 barrels of Real Tesoro’s Fino Tío Mateo. Outside past the production plants are lovely horse stables and the carriage house. The larger, two-story space was like an art gallery with the cellar in back that holds 25,000 barrels of Valdespino and Real Tesoro soleras. The barrel room is only accessible to tourists from above for a lovely panoramic view. Once back in the main building, I sat down to my private tasting with Jaime. He was soft-spoken and full of great details about each wine. Manzanilla Deliciosa en Rama by Valdespino, bottled in 2014. Five days after my visit, they bottled for 2015. Grupo Estévez only bottles this Manzanilla in the spring, because they feel the flor has more character than in the fall. The flor, literally meaning flower, is the yeast growing on top of the wine. In the fall and spring, it is much more active and grows thicker, which adds intense flavor and aroma to the wine. Being en rama, or unfiltered, the color was a dense golden tone. Even though this had been bottled for nearly a year, it tasted super fresh and salty. Jaime explained that most manzanilla soleras have five criadera levels. Manzanilla Deliciosa has six criaderas, which helps age the wine just a bit further. 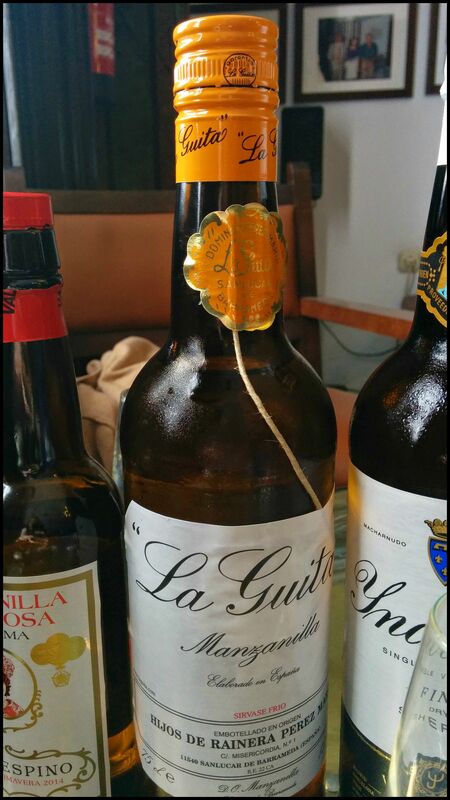 La Guita Manzanilla bottled in December 2014. Jaime told me the story that back in the 1800’s the bottles had no markings or labels. This manzanilla had the reputation for not only it’s high quality, but for having a winemaker that demanded up front la guita, the slang term for cash. You drink it you buy it. Guita also means string or twine. Today, every bottle of La Guita has a piece of twine attached as tribute to this story. Even though it’s more commercially produced, it has not lost its reputation for high quality. It would pair well with crudo, jamon Iberico, fried fish and anything salty. 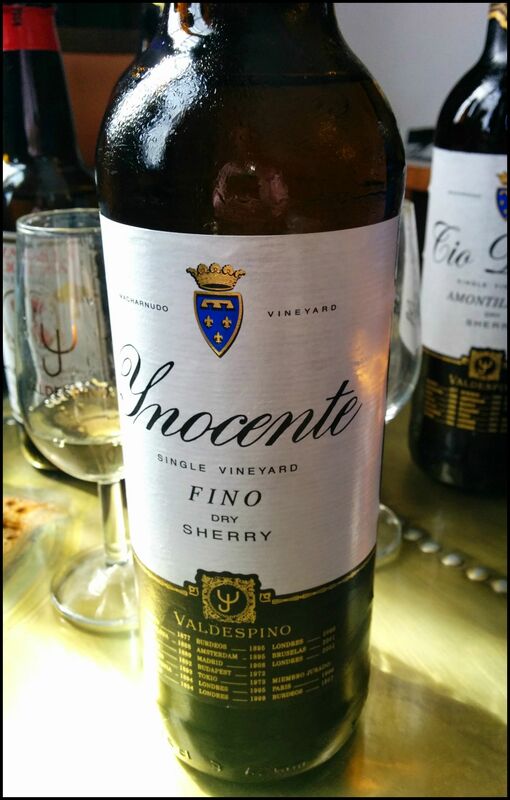 Fino Inocente by Valedespino. This is a very unique Fino. It’s only uses grapes from a single vineyard at the highest altitude and has the best Albariza soil. Grupo Estévez maintains tradition by barrel-fermenting the new wine, which goes into 400 barrels in a single solera with ten criaderas. The wine ages for ten years under the flor. Jamie explained that the wine is already very good at five years old and they could bottle it at that time. However, they want to go further to the end of the yeast’s life before it completely dies. Amontillados Tío Diego by Valdespino. After the wine aged as Inocente for ten years biologically and the flor dies off, they age it another five to six years oxidatively to become this amazingly delicate amontillado. Even though the nose has the caramel notes of a typical amontillado, I could really taste the influence of the flor. It was dry with strong almond notes. It would be great with artichokes! Amontillado del Principe by Real Tesoro. This was a classic amontillado style. It is aged eight to nine years under the flor, then another nine to ten years oxidatively. Compared to the Tío Diego, this was darker like an Oloroso, and had more caramel notes. 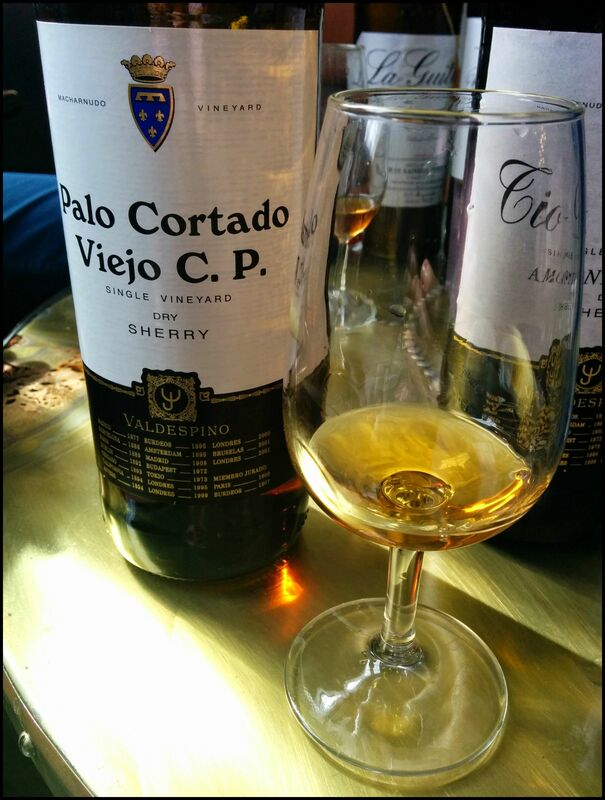 Palo Cortado Viejo C.P. by Valdespino. This was the first Palo Cortado I ever had when I first discovered sherry. 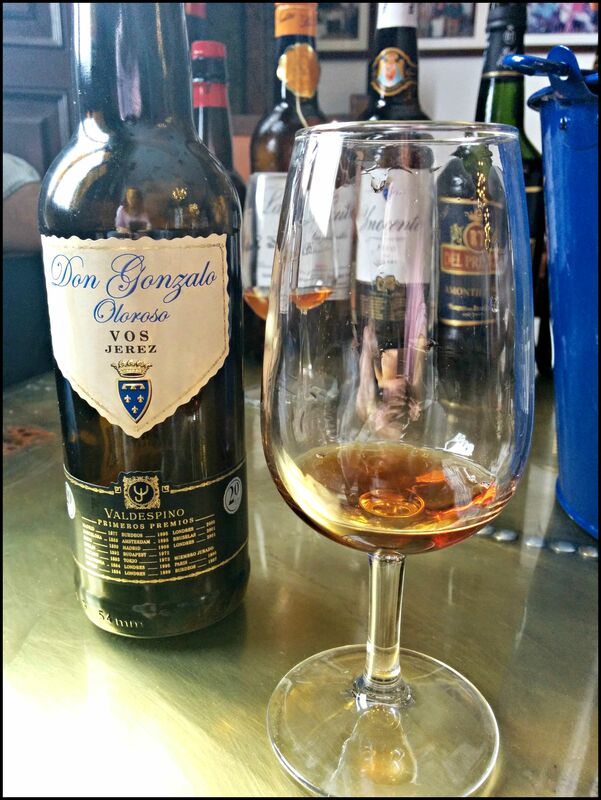 This Palo Cortado began either as a barrel in the Fino Inocente solera or one in the Amontillado Tio Diego solera. Because the wine was not reacting to the flor in the same way as the other styles, the barrel was removed from the criadera. It’s very delicate and the rock star of their wines. The nose was like Amontillado Tío Diego, but on the palate it felt a bit more like an Oloroso. Oloroso Don Gonzalo VOS by Valdespino. Jaime spoiled me with this bottle that represented soleras established over one hundred years ago. Jaime calls this one the liar; it smelled sweet, but was quite dry on the palate. It had a unique toasted character and a very long finish. Amontillado Coliseo VORS by Valdespino. 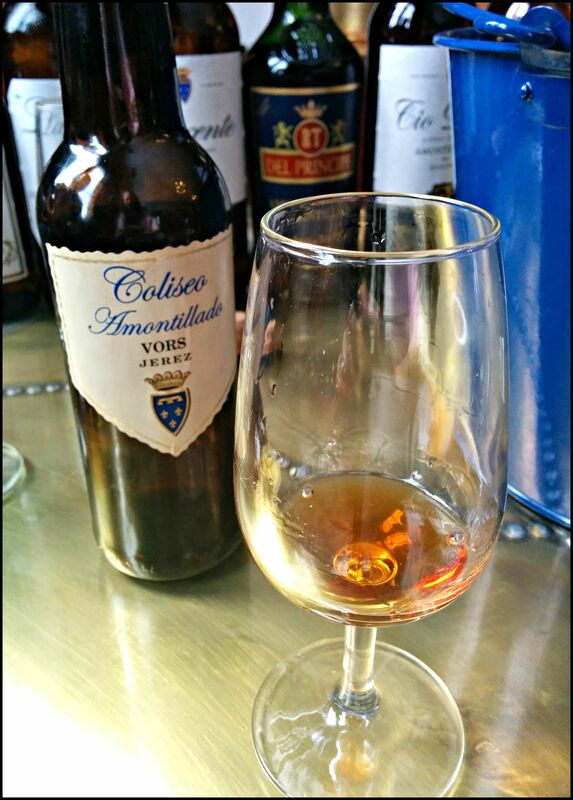 This Amontillado actually started as a Manzanilla in Sanlúcar. 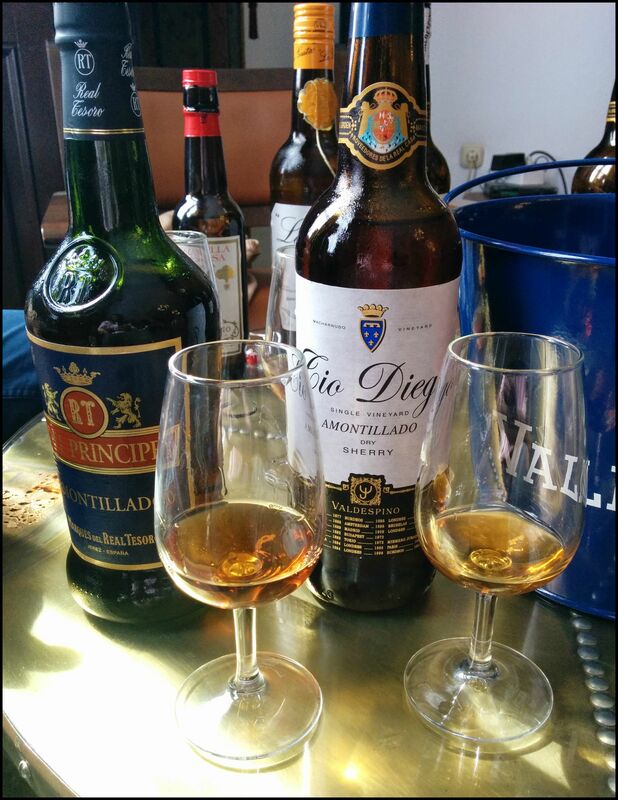 Once the flor died, the wine was brought to Jerez to age as an Amontillado. It was concentrated and intense and averaged around 40 years old. As Jaime explained, the flavor cuts like a knife right down the middle of the tongue. Pedro Ximenez El Candado by Valdespino. I love the story behind the name and the reason for the little padlock attached to the bottle. Many years ago, the wine maker had a client who loved the PX so much; he bought an entire barrel for his own consumption. 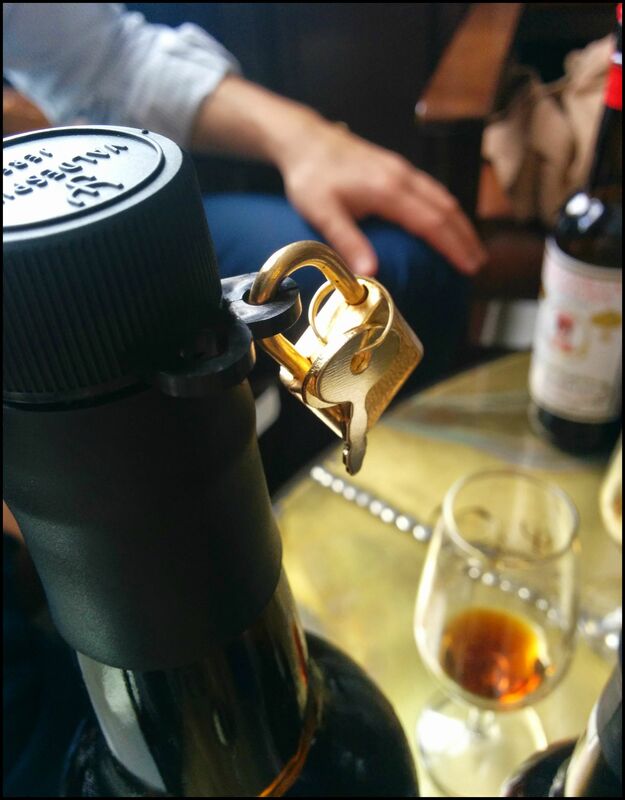 It was set apart from the other barrels with a padlock, and the client could come and taste using his own key. The workers all referred to the barrel as el candado, or the padlock. Today, the cap on each bottle has a little hole to allow its owner to keep it locked. I loved the balance between its acidity and sugar. It’s aged for eight years to keep it nice and light. 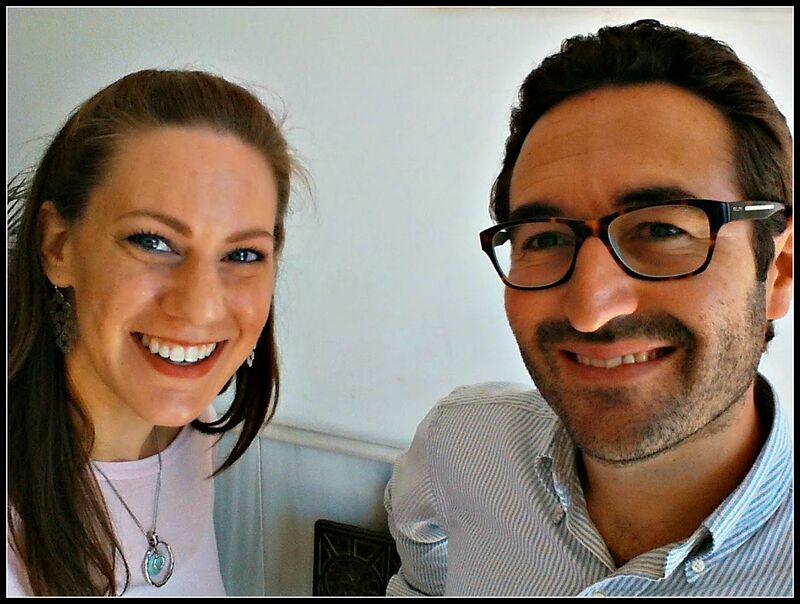 Jaime Gil was the first to introduce me to Valdespino sherry, and this grand tasting was a clear reminder why the wines from Grupo Estevez have won me over!